Now more than 500 pages!!! * ie., accordion & bayan, concertina & bandoneón, harmonium & reed organ, harmonica, shêng, sho, khaen, kobing, etc. 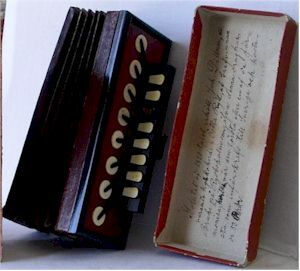 Is this the World's Oldest Accordion??? The purpose of The Classical Free Reed, Inc.
to enrich the quality of life on our planet and to preserve music as an art form. This site began on August 21, 1997 and is currently made possible by a grant from Robert Stead of Dearborn, Michigan. About The Classical Free-Reed, Inc. Contact The Classical Free-Reed, Inc. The Classical Free Reed, Inc.
To contact webmaster Click Here.